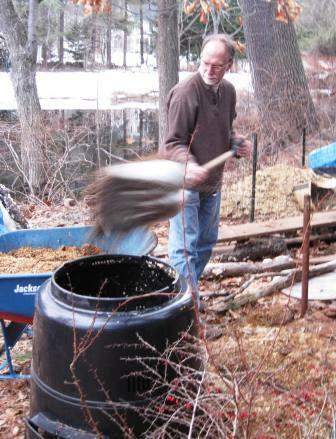 Bob is dumping the delicious compost into the garden bed. 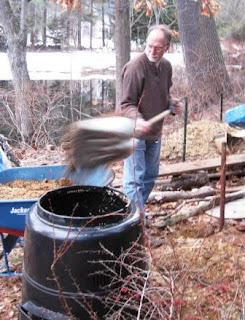 Bob moves compost from the bin to the wheelbarrow. These fresh clean wood shavings shavings feel great. 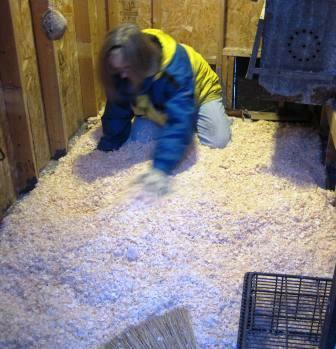 A good cleaning of the coop was long overdue after the long snowy winter. The hens spilled a gallon of water and dampened the bedding about a month ago. It was so cold and snowy I didn't get around to cleaning it up until yesterday and felt guilty about it. In addition to moving the old wet bedding filled with manure, I vacuumed the hardware cloth on the openings and swept away the cobwebs to keep the air clean. 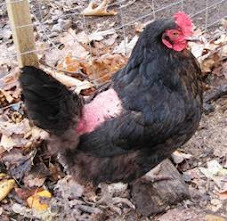 Hens are sensitive to their environment. They like it clean, dry and smelling sweet. 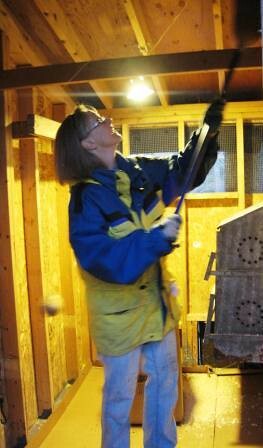 Last month, my son Ian's renovations to the coop layout and doors for humans and egg collecting reduced the moisture that tracks in. The coop stays dryer because I don't have to go in very often. Thank you farmer Ian. The hens thank you. My next adjustment to the interior is to re-arrange the roost and create a droppings board underneath to minimize the cleaning. A young person told me at the beginning of my chicken journey, "Chickens are basically crapping machines." He was right! The manure does make for a hearty garden and local food right from my backyard. Becoming a chicken keeper has required a huge learning curve. I'm continuing my egg-ducation by reading more about chicken care. The delicious eggs make it all worthwhile. Even cleaning the stinky coop.